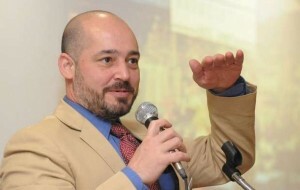 I’ve done a pretty cruddy job of telling you about Joe Minicozzi and why he is the featured speaker of our upcoming Walkability Summit. And since early bird registration for the event closes Monday, and the Lab starts in three weeks, it’s probably a good time to tell you why you’re gonna remember September 19th forever–if you come and watch him speak. The first time I saw Joe speak was a few years ago at a conference in San Diego. I get all geeked out when talking about the economics of walkability, so when I saw that Joe was giving a presentation on the topic, I had to go. Even though I’d never heard of him. Joe Minicozzi stepped up and was dazzling. He can dazzle you, your boss, and your local governing board with his numbers. His tax analysis of comparing compact downtowns to urban sprawl is really awesome. He shows that even the crappiest little downtowns well outperform the traditional power centers we’ve all come to loathe (or love?). It’s really hard to argue with his analysis. And how he delivers the message. It’s powerful. He and his firm Urban3 have been hired all across the country to do analysis of towns and regions. It’s starting to get city leaders thinking differently about the kinds of developments they are approving and how they are essentially throwing tax money away by not investing more in their urban cores. I don’t want to say too much because I like surprising people. But this dude is legit. You all went crazy when I shared his write up in Forbes a few months ago. I should note that we have some other awesome speakers lined up for Friday too hailing from all over the country: Washington DC, Long Beach, Louisville, Phoenix, Huntington, WV, Asheville, NC, Cincinnati, Dayton, and Columbus, OH. OH, and perhaps my favorite part of all, MORPC’s blindfolded walking audit of downtown Columbus! If you aren’t joining us, then I hope you’re on a beach somewhere…and not pushing papers and sweeping virtual mines. 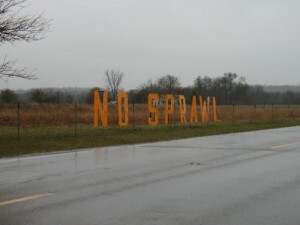 We have enough urban planners and others like them doing that already. Click here to register for the Summit and Great Placemakers Lab!! I’m so freaking excited to announce the details of our Columbus Conference today!! But first, I want to tell you how this came about…and why it took so long to get here today. I am actually based out of the (ridiculously sunny) Sacramento, CA area, but I am familiar with Columbus. I started out my career working at the Miami Valley Regional Planning Commission in Dayton, OH. My wife (then girlfriend) attended graduate school at OSU for City Planning, and I used to visit nearly every weekend. We both loved Columbus, but she landed a great job out here and we decided to give California a try. We had enough with ice scrapers. 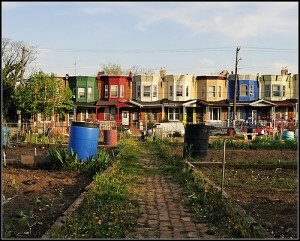 Fast forward several years, and I created a Facebook page related to Walkable Neighborhoods. The page was taking off, and I noticed that our #2 fanbase behind LA was Columbus. At the same, I was kicking around an idea in my brain I’ve had for a long time: I really wanted to host a walkability conference. Some of you have been following Walkable Neighborhoods since 2005, and I thought a conference would be a great way to connect and learn from each other and people that have been doing this for a long time. I remember I was having a particularly bad day in January. One of those types of days where you just want to go out and do something crazy because you just don’t care. I just had a hunch from watching the posts on Facebook that folks in Columbus were going to be really interested. And boy, were you ever! According to Facebook, my posts announcing the Columbus conference were viewed over 250,000 times. Yes, 250,000. By count today, over 1,300 joined the conference email launch list. And over 1,800 folks within the city limits of Columbus alone have joined the Facebook page. I had a good feeling that the demand was there. Now it was time to find a walkable venue in Columbus. It took a lot of back and forth with folks, but I finally found a venue I was comfortable with, and the dates that would allow me to attend my fantasy football draft IN PERSON with my friends in Dayton!! I even had a keynote speaker all set to come. I was literally a couple of days away from signing contracts for the venue and speaker. Then, I get a jaw-dropper of an email. It said that another conference with very similar topics was being planned in Cbus for September 2014. There was already substantial support, dates and venue were set, and speakers were coming together. But the email did say that he’d like to speak and look into collaboration. I knew that it would be hard to get folks out to two conferences, and if the other hosts were not interested in partnering, it could be the end for this year. But after a long phone conversation with Matt Shad (whom many of you know) that weekend, we were both convinced that we had to work together. There was so much synergy between our two efforts that it made perfect sense to combine efforts. It took a few weeks of back and forth of trying to get everything solidified, but I think it was well worth it. And so here we are today, announcing the 2014 Great Placemakers Lab, September 16-19 at the Westin Columbus Hotel in Downtown Columbus. 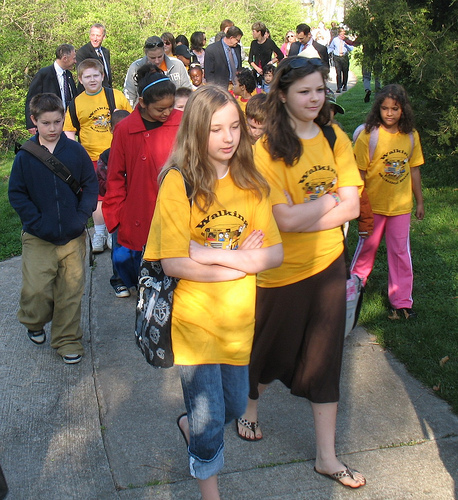 The event will be jointly presented by the German Village Society and Walkable Neighborhoods. 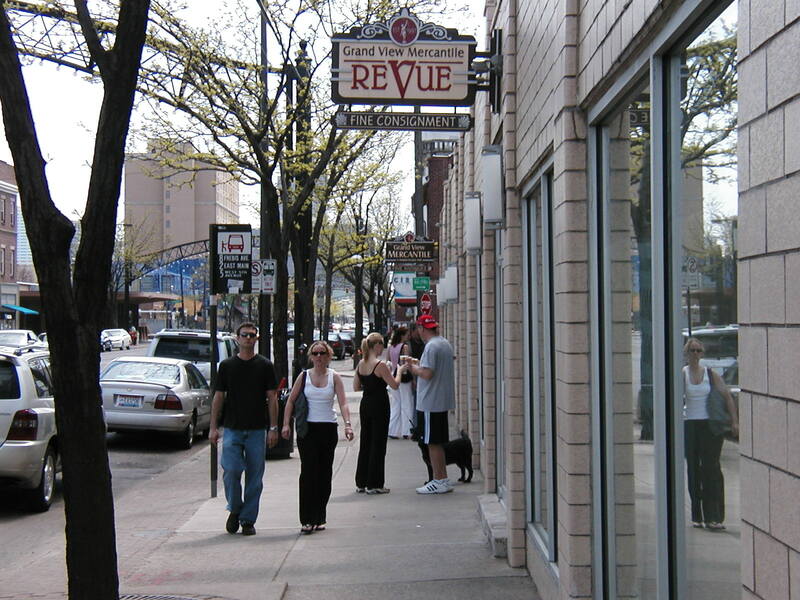 – Thursday, September 18 – A day out on tours of Columbus neighborhoods!! One thing that I’m really excited about for Friday is that the Mid-Ohio Regional Planning Commission (MORPC) is organizing two audits where participants will walk around downtown Columbus…blindfolded!! MORPC has (safely) led these tours in the past and they really help folks get a small sense of what it’s like to not be able to see and navigate a city. You can “sense” if downtown lives up to the challenge. On top of this, we’re going to do some incredible tours and bring in some of the top experts in placemaking and walkability. Best of all, most, if not all of the workshops will be included as part of the registration fee!! Don’t think that I can’t see that you just started dancing. Space is going to be extremely limited on some of the workshops so it’s important you register quickly. The tours will be first come, first serve. So, make sure you go register now to make sure you get on these tours. As I mentioned, we have thousands of people within the city of Columbus alone on our lists (which people opted to join), so our roughly 250 spots for the conference could go very quickly. You can also click here to join our registration info and updates list. And now I’ll leave you with a classic line from a song by The Happenings: See you in September!! 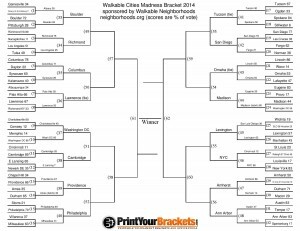 Cast your vote below for who goes on to the Final Four in the Walkable Cities Madness Bracket. Now we’re on to the Round of 32, but not before some close matchups in the First Round. LA barely squeaks past Tulsa…though I’m guessing that’s because most people voting haven’t been to LA recently and only hear it’s the land of the car. However, it has a pretty great transit system by American standards and some really cool walkable hoods. Madison and Washington DC went toe to toe and DC comes out ahead. 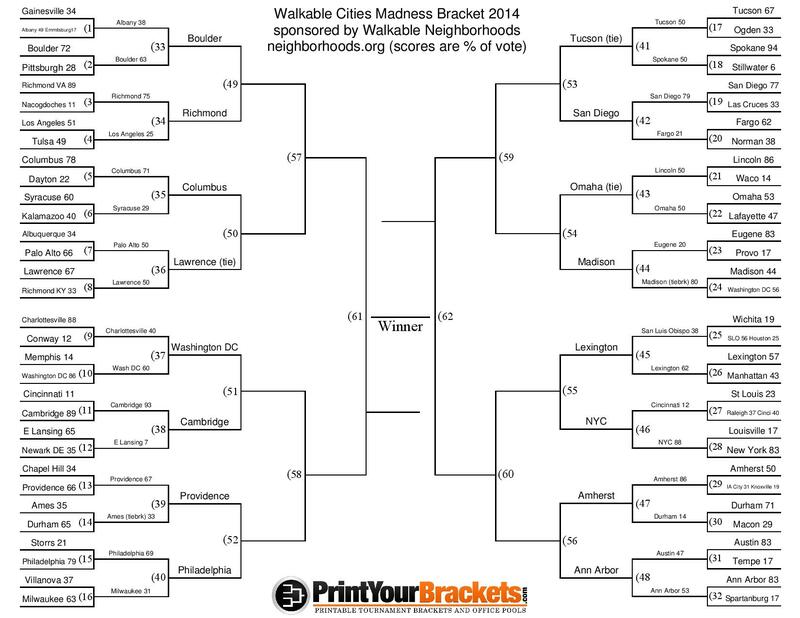 But since DC can’t win twice, Madison beats Memphis on the “most votes” tiebreaker. The Round of 32 has some intriguing matchups, including the Battle for Nebraska: Lincoln versus Omaha! I also like Palo Alto versus Lawrence, and Eugene versus Madison. Now, please vote below and share with your friends! 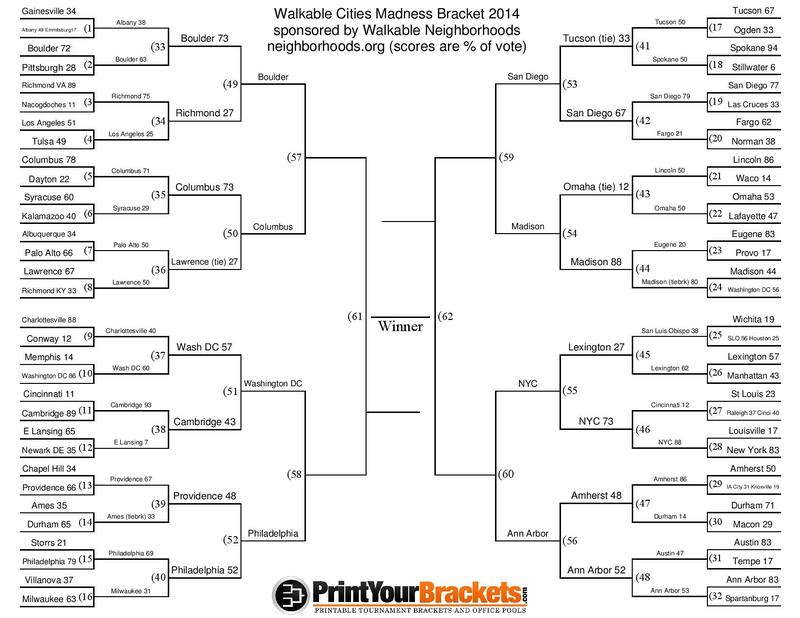 Will Austin, TX be a favorite to win the Walkable Cities Tourney? 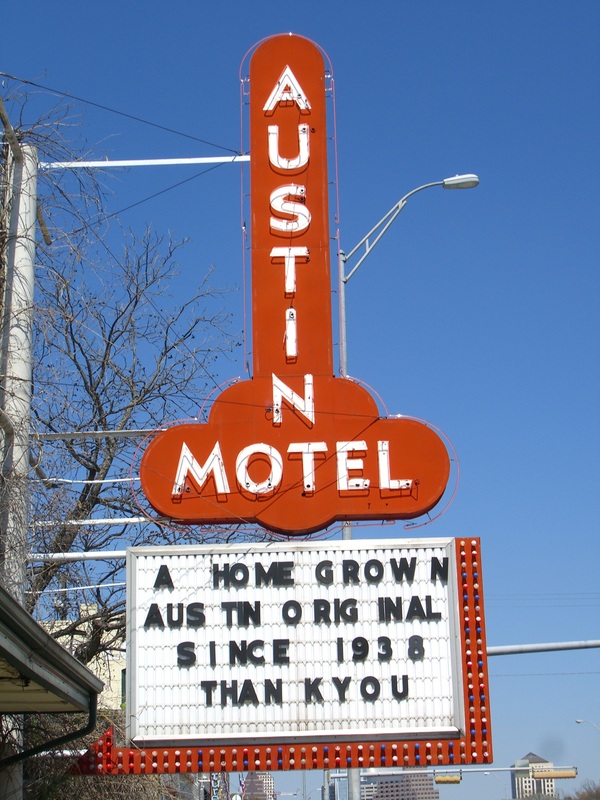 I am a HUGE college basketball fan…and obviously a HUGE walkability fan too. So it was only a matter of time before I found a way to mashup two of my loves. Enter the NCAA Tourney Bracket. The concept is simple: take the 2014 NCAA Men’s Basketball Tournament Bracket and instead of selecting which team would win on the basketball court, select the school that’s located in the more walkable city or town. I do realize this is really difficult to do, but now that I’ve done it, it was a great learning process and fun to fill out my bracket. And you can too. Just fill out the bracket below and click submit. The winners of this round will move on to the Round of 32. Now I’m sure you’re thinking, how do you rate which town is more walkable? Well, that’s up to you. I used Google Maps for the places I wasn’t familiar with. Some will probably use Walk Score. Others will just know. That’s what makes it fun. One not so fun thing is that one VERY IMPORTANT team was missing this year. My Illinois Fighting Illini We just missed the cut. It’s probably because they knew what a dilemma it would be for my walkable cities tourney because the campus is split by two cities: Urbana and Champaign. So do I list Urbana where most of the academic buildings are? Or Champaign where the basketball games are played? Or both? Or will the world end first? Well, I hope I have that problem next year. This year it’s NIT obsession time!! Enough rambling, on with the brackets. 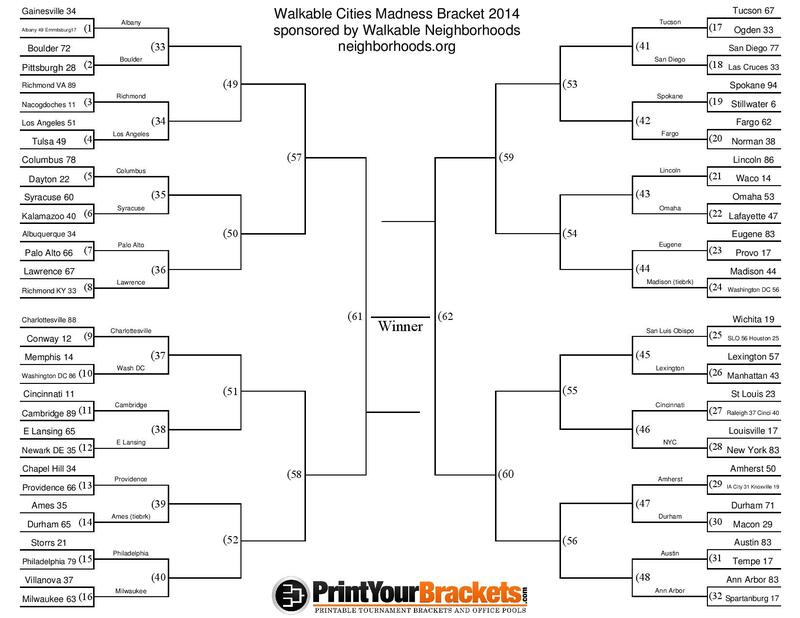 The First Round Bracket voting will close after the games on Friday night. Oh, and after you submit your votes below, please share this with all of your friends. Then come back in a few days, see who won, and vote in the next few rounds. Man, there are some really tough matchups in this bracket! If I had to guess at which cities emerge to the Final Four, I will guess Columbus out of the South (we have A LOT of Facebook Fans in Columbus), Washington DC out of the East, a shocker…Eugene, OR out of the West, and New York out of the Midwest. The East looks like the toughest bracket!! P.S. – If you have an interest in taking or teaching walkable neighborhoods related training courses, sign up for our interest list by clicking here. With technology booming by the second, it’s impossible to attend every e-conference or participate in every webinar that sounds interesting. Fortunately for us, the American Public Health Association archives their webinars and we can view them when it’s convenient. This one is worth a look–especially for anyone bridging the gap between planning and health. If you are in a fiesty mood and want a little more fuel for the fire, check out this article by GOOD about how urban sprawl is unhealthy and the way we measure success. I agree with the article that using the traditional level of service to measure success is a mistake. We should be designing for the pedestrian as the most vulnerable user of our roadways. How do we do it? Some think that when the baby boomer generation fully retires, there will be a shift in philosophy and thinking. I’m not sure that is going to make a difference. There are too many young planners and designers that are getting sucked in and being molded to the traditional way of thinking. These youngsters are going to be the old grey hairs someday and may not know any different. I think the best way is to continue to have your voice heard. Speak out at public meetings, write your local elected officials, participate in MPO committees, actually send in public comment when it’s requested, work with the designers instead of taking an ‘us’ vs ‘them’ approach. Sounds easy, doesn’t it? It’s not. It takes patience, endurance, good timing and a little bit of luck. 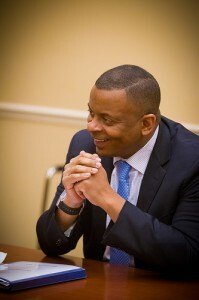 On July 2nd, Anthony Foxx was sworn in as the new Secretary of Transportation under President Obama. Prior to taking the reins at USDOT, Foxx was the Mayor of Charlotte, NC. He led some significant projects in Charlotte including expanding the airport and getting another loop road built. For the cyclist or pedestrian, the most notable was the extension of the light rail line. Let’s see how’s he’s done in his first 15 days. A mini report card if you will. Foxx has said many times that he will focus on safety and efficiency. If this were like school, the chances of having a big test in the first 15 days would be slim. Foxx had to get his feet wet with the plane crash in San Francisco. Not only did it affect transportation, there was the inappropriateness of the intern and the names of the airline crew members. An unfortunate event but the crash provides some credibility on the need to focus on safety. He has received continued support from the American Trucking Associations. Hey, get support early and often. He has announced a $421 Million loan to expand SR 91 in California under the Transportation Infrastructure Finance Innovation Act (TIFIA). The claim is that the expansion will reduce congestion and improve the local economy. The people of southern California get tolls for the next 50 years. Indirectly, if more cars can travel on a freeway, there may be less vehicles on the local roads. This could reduce bicycle and pedestrian conflicts and improve the quality of life. It’s a stretch so we’ll give partial credit. He announced $1M in grants for US veterans and military families to receive training for transportation related jobs. These grants went to 6 colleges throughout the nation. It seems that most of the training is for motor carrier type positions. Human scale, walkable neighborhood type projects will not likely see any benefits. You have to click here for bicycle and pedestrian specific projects. You know, those projects that aren’t always flashy, often aren’t the subject matter of great press releases but undoubtedly improve our communities? Zilch. If I had to assign a letter grade to all of this, it would be a ” B”. Foxx is doing well but highways are only one piece of the transportation puzzle (albeit a large piece). I am little concerned that walking and biking can easily get lost in the ‘infrastructure efficiency’ discussions. My experience with many transportation engineers is that efficiency equals pushing more cars through at a faster speed. Level of Service often rules the roost when it comes to efficiency. Let’s be fair. It’s only been 15 days and the number of issues that Secretary Foxx must face is impossible to quantify. Maybe we revisit the report card in say 60 days and hopefully there is news on other travel modes that focus on making our communities safer for cyclists and pedestrians.